WV AgrAbility was well-represented at the 2016 AgrAbility National Training Workshop. Representatives from all four funded partners were present including: West Virginia University (1862 Land Grant University) - Tom Stockdale, Brandon Takacs; West Virginia State University (1890 Land Grant University) - Melissa Stewart, General Gilliam; The Arc of the Mid Ohio Valley (disability non-profit) - Inetta Fluharty; West Virginia Assistive Technology Systems at the Center for Excellence in Disabilities at WVU (state Tech Act Project) - Carman Fullmer; along with farmers Danny Vaughan and Delilah Willis and her parents. WV AgrAbility staff Carmen Fullmer and Inetta Fluharty co-presented a session on April 13th at the AgrAbility National Training Workshop on "Caring for the Caregiver". The session shared coping strategies for caregivers, suggestions for successful changes in roles, and assistive technology ideas that can be helpful for both the caregiver and the individual. 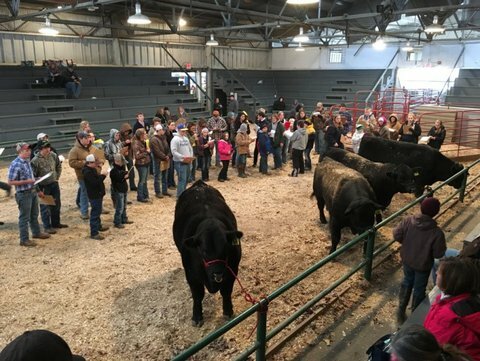 WV AgrAbility staff attended the 2016 WV Beef Expo and Stockman's Contest April 7-9. Staff spoke to FFA, 4-H'ers, and livestock producers from around the state about assistive technology to assist in agricultural production. Demonstrations of quick hitch systems, bale wagons, and drive through gates was highlighted during the breaks of the competition. Specific information was shared with FFA and 4-H members about farm safety and age-appropriate tasks on the farm. The third annual WV Urban Ag Conference was held on the campus of West Virginia State University on April 30, 2016. Food is the tie that binds us all together, and this conference provided the opportunity to be more resilient and sustainable even if your production is in an urban area. WV AgrAbility staff presented a session to 35 producers on "There's an App for That" and also provided information to the 225 conference attendees at the AgrAbility information booth. A demonstration of accessible gardening techniques and ergonomic tools to make an accessible garden in an urban setting was also provided. 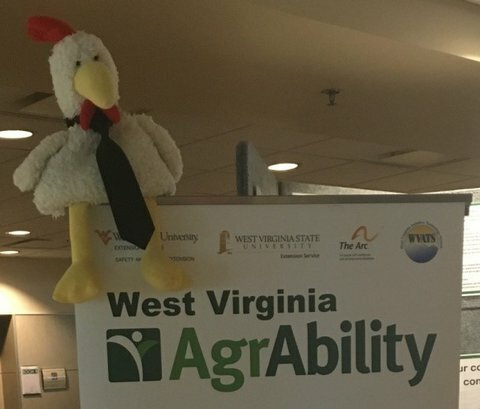 Chicken Stu, the spokes-chicken for the conference, made an appearance at the AgrAbility booth during the conference. Farming: it's so citified! West Virginia AgrAbility continues to provide information and resources to farmers requesting assistance. During the month of April, WV AgrAbility staff conducted two farm-site assessments and is working with West Virginia Division of Rehabilitation Services on securing funding for the needed agricultural modifications. Additional advocacy was provided to a farmer in securing the needed funding for farm site modifications from West Virginia Division of Rehabilitation.